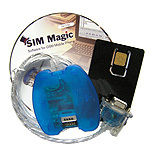 Sim Master 4 device is next generation device that support back-up and cloning GSM cards. By using this device you can clone your GSM card, so you can use it in other phone. Device comes with special GSM Silver card that can store over 8 card into 1 !! For example you take 8 diffrent cards that you have from different operators and copy it to this card - after you have access to all cards without removing it from phone !